Hurricane — part of the Nautic Global Group — is the top-selling brand of deckboats in North America. To stay at the top, the boatbuilder always tries to deliver a full line of boats with popular features and amenities. The Crossfire is a new tow sports oriented model based on the SunDeck Sport SS203. Like all of Hurricane’s deckboats, it has a wide-body hull that carries its beam forward, virtually to the bow. This creates a boat with a superior volume-to-length ratio compared to a traditional bowrider. The hull has a shallow draft design, allowing it to venture into skinny water and making it easier to beach the boat. Essentially, it’s a traditional fibreglass boat that provides some of the benefits of a pontoon. Designed for inland waters, the Crossfire’s hull features sponsons for stability and lifting strakes to improve performance and fuel efficiency. Reverse chines enhance planing and minimize bow lift for improved visibility. The trade-off with this design is performance. 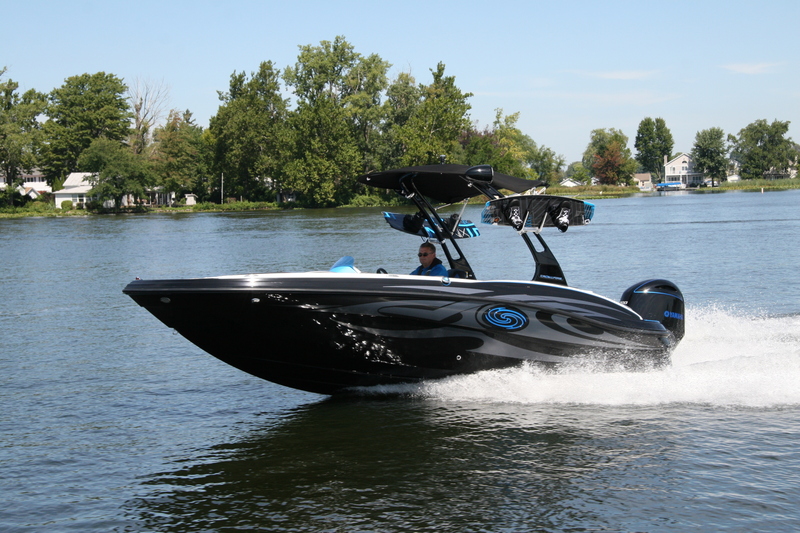 A traditional modified-V boat powered by the same Yamaha F200 will hit higher speeds and accelerate quicker. That’s not saying the Hurricane doesn’t perform well. A top speed of close to 45 mph is quite good and the ability to cruise at 20 to 24 mph efficiently, turning 3000 to 3500 rpm, is definitely due to the hull design. 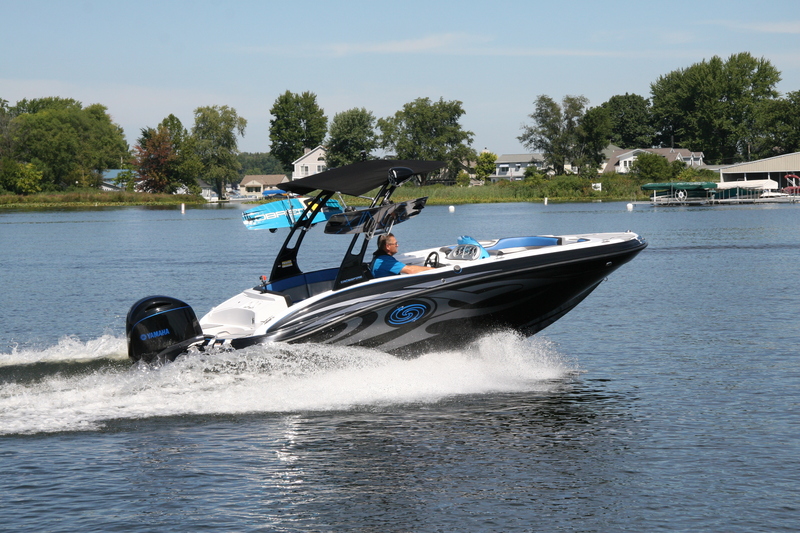 You can purchase a modestly priced 203, but the Crossfire is loaded with features geared to tow sports and fun on the water. Bow and stern platforms provide seamless access to the water or beach, with hidden telescopic boarding ladders and SeaDek mats. The mats are used through the cockpit, providing durability and comfort for bare feet. 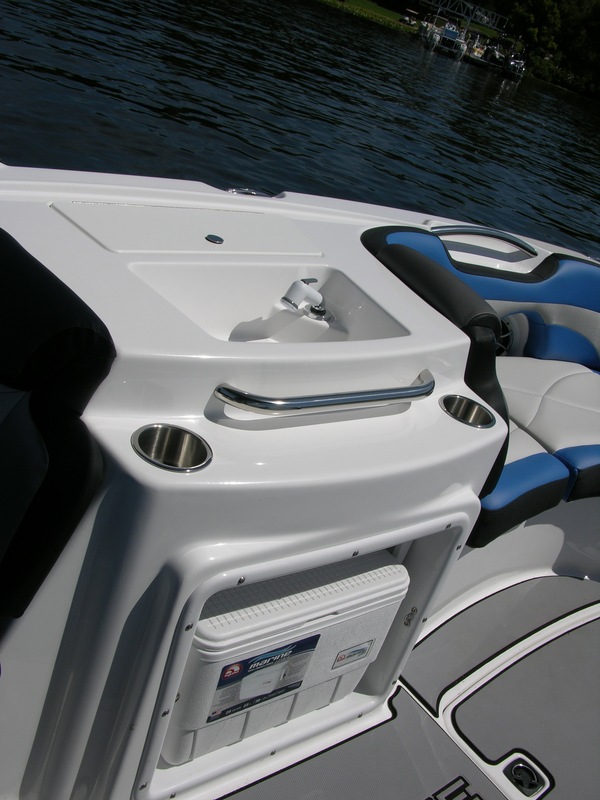 Maximizing use of space, the 203 has a wet locker under a hatch on the port swim platform. Batteries are under a hatch in the port transom. The main cockpit is expansive, with plenty of deck space for moving around and gearing up. The seats wrap around from the transom to the port-side refreshment centre. 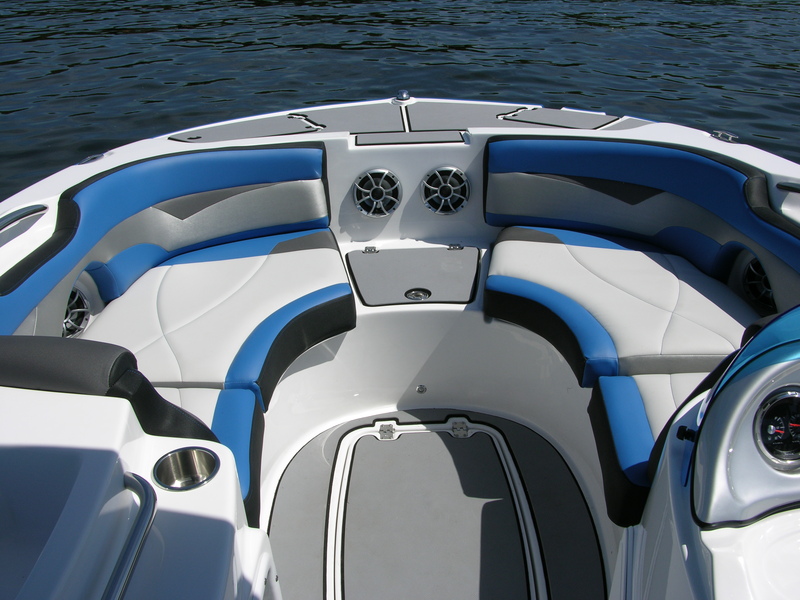 The upholstery is top quality, with blue and black accents and trim that complements the hull colours. The moulded seat bases here and in the bow provided storage for everything a gang of almost a dozen passengers will need for the day. The refreshment centre and helm console are between the bow compartment and main cockpit. The refreshment centre has a sink and pressure water system, waste receptacle, drink-holders and a marine cooler that tucks into the base. It’s a nice touch on a 20-foot boat. The helm is clean and uncluttered, with a stylish tilt sport steering wheel. 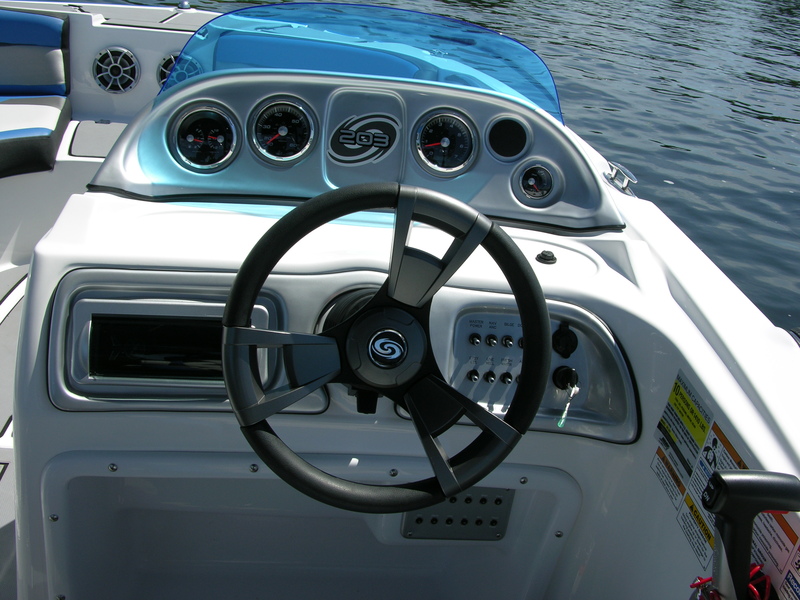 The upper helm sports a complete set of gauges including a combination fuel level and voltmeter, speedometer, tachometer and trim gauge. The helm seat is first-rate and easily adjusted. Befitting a decked-out boat like the SS203 Crossfire, tunes are provided by a powerful Sony marine stereo system, with Bluetooth, transom remote, Sirius satellite radio, amplifier, subwoofer, six cockpit speakers and two tower speakers. The deckboat design concept really shines in the bow, with comfortable, adult-sized seating. There’s a large board locker and a draining locker under the bow step. Numerous stainless steel cup-holders, recessed cleats — including the often-missing midship cleats — LED lighting and underwater lights, and a folding wakeboard tower with board racks and Bimini top off the Crossfire. Even if you aren’t into wakeboarding, the tower just sets the boat off. If that’s not enough, the black colour scheme, with bold blue accents and graphics, and the Yamaha F200 make a bold statement. This boat is featured in the Winter 2015 issue of Boats&Places.